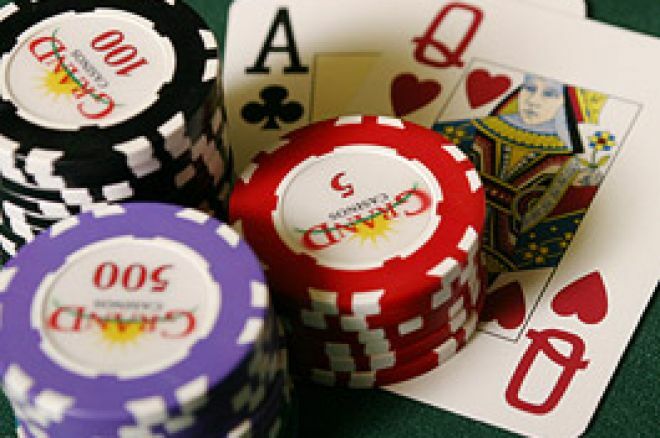 Poker Strategy: Pot Odds- Are you Getting the Right Price to Call? You are sitting pretty in a tournament with the chip lead. You hold QsJs, and the flop comes Ks7s2h. The pot stands at 1,000, and your opponent moves all in for 2,000. You believe that he has your queen high beat, but that you are drawing to your nine outs to win with a flush. Do you call? The decision is one that depends entirely on the pot odds you are getting. Where you will finish either with nothing or with a made flush, there is really no psychology involved, just mathematics. To work out our pot odds, we just need to know two figures; the first is our investment, and the second the total size of the pot. Here, our investment is 2,000 to call our opponent's all in, and the pot in total will be 5,000 (the 1,000 already in, our opponent's 2,000 and our 2,000 call). So, our pot odds here are 40%; this means we need a 40% chance in order that we are getting the correct odds to call. You will remember from the outs article that the chance of drawing to a flush (9 outs) is 36%. Therefore, we are not getting the correct odds to call, and we should fold. Pot odds is done through an easy calculation, and it tells you the minimum chance you need to have of winning the hand for a call to be right. Let's look at an example where we hold AsKs, and the flop comes 10s8s2h. We know for sure that the nut flush draw gives us nine outs, but it is possible that we hold two overcards over our opponent, and that the ace or king will give us the win. Strichtly speaking, you should only count certain outs, but you can sometimes stretch this if the calculation leaves you just short of being able to call. Our chance of making the best hand with 9 outs is 36%, but there are a possible six overcards as outs, and so our odds could be as good as 55%. If the pot odds we were being offered were again 40%, the extra possibilities would definately justify a call. Suppose you hold As10s, and the flop comes 9s5h2h. Your opponent moves all-in, and you credit yourself with three outs from your overcards (this would be a good assumption, and effectively credits him with having either A9, or jacks, queens or kings). Note also that you could hit running spades to hit the nuts, and for a running flush draw you can add another 5% to your chance of winning. This makes a reasonable difference, and turns your 12% chance for three outs into 17%. Running double gutshot straight draw- Say you hold Q10 on the 932 flop. You can hit either J8 or JK for the win, and this is a 3% chance. Running gutshot straight draw- This is where you have just one specific chance for the win. Holding AK on a 1032 flop means only a running queen and jack will give you a straight. This is about a 1% chance. Normally your opponent will not move all-in on the flop. When there are still chips to bet, the pot odds you are being offered are of course only to see the next street. To work out your chance of hitting the winning card, you can only count one card, and therefore all the probabilities are halved. However, the situation may get better for you. If your opponent is close to going all-in, you should assume that he will do on the next card. Then you can base your calculation on seeing the next two cards, with your opponent betting his whole stack. Example: You hold AsKs, the flop comes Qs9s2h, and your opponent bets 1,000 into the 2,000 pot, and leaves himself 1,500 behind. The calculation I would do is to assume your opponent will bet his remaining 1,500 on the turn, making his investment 2,500. The total pot will be 7,000 (the 2,000 in the pot, your opponent's total 2,500 bet and your potential 2,500 call). Therefore you pot odds are 2,500/7,000 X 100%, which is 35.7%. This is lower than the 36% chance you having of making the nut flush, and so you should call. If the stacks are deep, and there is no potential of your opponent going all in, you can use something I will call the projected pot size. It assumes that your opponent's bet on the turn will be the same size relative to as his flop bet. Therefore, if he has bet half the pot on the flop, assume that he will bet half the pot on the turn. Example You hold the same hand, AsKs, on the Qs9s2h flop, with the pot at 2,000. Your opponent bets 1,000, and you both have plenty behind…. Assume that his bet on the turn will also be half of the pot. On the turn, the pot will be 4,000 (the 2,000 that is currently in the pot, your opponent's 1,000 flop bet and your 1,000 call). Therefore, we are assuming our opponent will bet 2,000 on the turn. This makes your total investment 3,000 (1,000 flop call and 2,000 turn call), and the total pot will be 8,000 (2,000 currently in + 2,000 going in on the flop +4,000 going in on the turn). This means the pot odds you are projecting you will be offered is 3,000/8,000 X 100%, which is 37.5%. With the possibility of the overcards working as outs, this justifies a call.